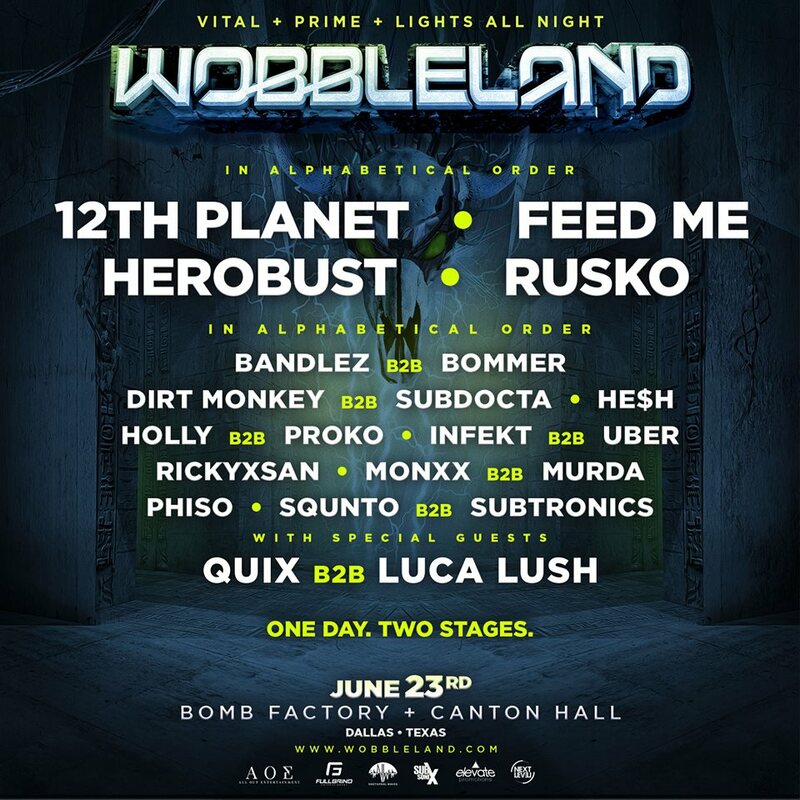 Wobbleland makes its Dallas debut on June 23rd with 12th Planet, Feed Me, Herobust and Rusko headlining the Bomb Factory and Canton Hall. Grab your tickets! Not being fully satisfied after destroying the Bill Graham Civic Auditorium in San Francisco, Vital Events decided to come to bass country to annihilate 2 venues in one day in Dallas; the Bomb Factory and the newly opened Canton Hall for Wobbleland Dallas. Taking place on June 23rd, bass will envelop Deep Ellum for a night of pummeling subs, immaculate lasers and the nastiest of bass faces. Announcing the return of Rusko to Dallas, he will be joining Herobust along with 12th Planet and Feed Me headlining this massive lineup. The bass scene cried for joy at the news this past October when Rusko announced he was cancer free and returning to music. After smashing ears in February at Wobbleland in San Francisco, Chris will be applauded once again when he invades Dallas this June. Prep for his set by checking out his recent EP "Has Made 5 More Songs." Not only do we have our ears being slayed by impeccable B2B's, we will be graced by solo sets from Dallas native He$h, LA native Rickyxsan and Canadian producer Phiso as well. Bass will reverberate through He$h's set, while Rickyxsan will experiment with rumbling subs and Phiso smashes the rails with heavy-hitting riddim. This is the bass lineup everyone has been looking for. With tickets still at low prices (GA is at $48) for this insane event, there is no reason not to get your tickets now. Click the button below for your tickets and PRIME, Vital and Lights All Night will see you all at Wobbleland Dallas. Get your bass face ready, you're going to need it.